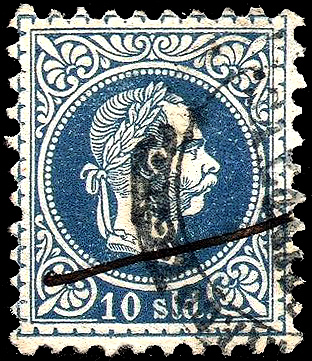 Austria - Coarse print or fine print? 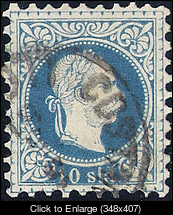 Early Austria includes stamps of Emperor Franz Josef that might require you to identify between fine and coarse printing. Once you've seen a few, it is easier to distinguish them. Usually. While looking for some coat of arms to post, I noticed these two side by side, and they give a pretty good example of the differences. Primarily, check out the laurel leaves, hair and whiskers. In the blue color, the differences are particularly easy to pick out. Can be tough when the hair lines on the nape of the neck, and the beard are somewhat hidden. 3. long top eyebrow line. I'm going for fine print. you? Great cancels, cjd! Please send them to me. I would go fine print too. Rod's comment about the eye curve line and the long eyebrow line are just the tips I'm looking for. The problem I have with these stamps is sometimes I equate heavy impression/light impression with course print/fine print. I would prefer more defined clues, which Rod provided! Would anyone like some additional practice? I'm with Ram, only based on the curve under the eye. As with Recess V litho, I like to get the Loupe on them, these scans are really not deep enough. When you see the raised ink through a Loupe, you know all about recess printing. Here, it's still a bit of a juggle, I equate with jkblue, ink deposit can sometimes have you thinking differently. Perhaps "practice, practice practice" will assist. I tried that route with Travancore's Watermarks, but gave up in the end. I surrendered. I've identified them as Coarse (type I), Coarse (type II) and Fine (type III). I had to rely upon the type characteristics of the lower left arabesques to make the call. Assuming that I've correctly identified them, they are, from left to right, Scott 29a (type I), Scott 29 (type II) and Scott 36 (type III). Will have to check out that note w.r.t the ornament. A little tough in the first case with the heavy cancel. Now, if we were to appear real techy Philatelists, we could identify the positions using the Thirkell Position Gauge. I can't help (yet) with the Thirkell Position Gauge so we'll have to settle for Irfanview arrows for the time being. Boy, those arrows really helped. I was having a difficult time orienting myself to the written description. 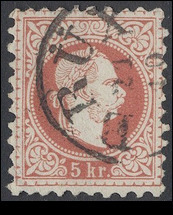 The 5 kr gives additional clues depending on the type. 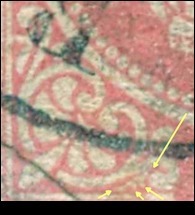 Type I or II are found with coarse printing. 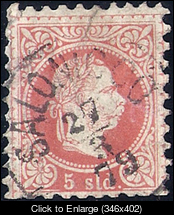 Type III with fine printing. Too bad the other denominations don't offer types too- then the coarse/ fine determination would be easier. Thanks for the quiz and the results- that was fun. In the interest of full disclosure, I also had difficulty making sense out of the note. 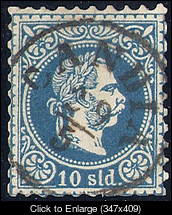 Using Scott's typology, the Brux-canceled stamp would be a type III. I just noticed this from back in 2013. Thanks Steve. I finally obtained an example of the 5k that clearly shows Type I. The three points at the bottom actually make it look like a tiny dinosaur. It is also a coarse print. 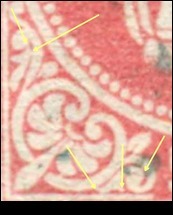 Here are another two Austrian Levant stamps to check if they are coarse or fine whiskers issue. Sorry to give links, but I am not yet familiar with how to upload an image. So both of your samples appear to be fine beard. 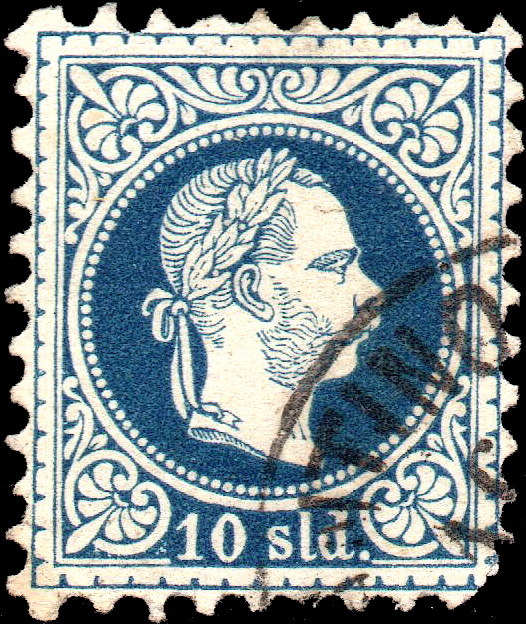 There are color variations in the 10sld. However the one on cover appears to not be the 9.5 basic perf?? The perfs are not exact. I spent a couple of hours reading about the coarse and fine issues. I am now more confused than I was before. 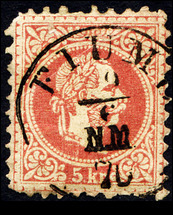 The information given by www.austrianphilately.com/gurahon/index.htm is somehow contradicting to what the forum suggests. So, I think the best way to tackle my questions, if you agree, is to post the images of the postage stamps that I am not sure what issue they are, and members of the Forum could express their views. I shall make even better images (scanned at more than 600 dpi) and upload them one by one. If you open a photobucket account and follow the above link you will be able to post images. 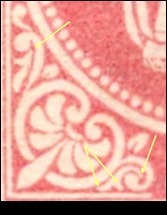 Regardless the handstamp date, what issue do you think these are? coarse or fine?